Vidya Academy of Science & Technology (VAST) is a state-of-the-art engineering college conforming to international standards. 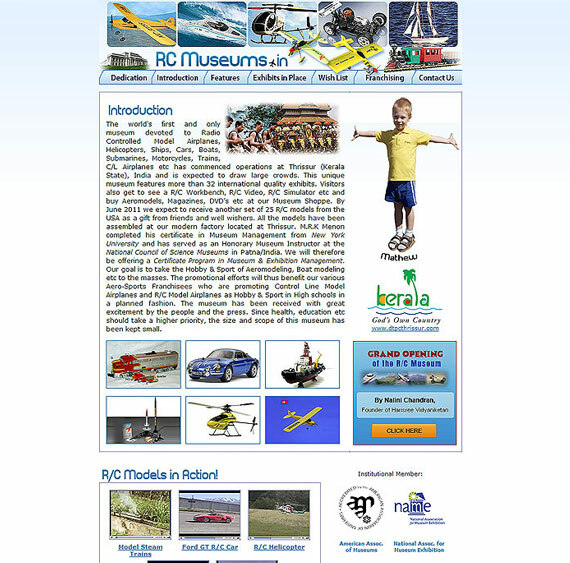 This model engineering college is approved by AICTE vide approval NO./06/ KER/ENGG/2002/91 dated 12/05/03 and affiliated to the University of Calicut vide reference No. GAI/03/3954/2003 dated 31/05/03. In few years VAST has evolved and achieved recognition as a notable School of Engineering with its competent and committed faculty, high quality infrastructure and high technology teaching aids ,and by providing a serene atmosphere that complements academic life. VAST has a holistic approach to education where academic training goes hand in hand with offerings that develop the body,mind and soul to prepare its graduates to be future leaders..
Maharaja’s Technological Institute is the oldest Polytechnic in Kerala State. Located in the heart of Thrissur, the polytechnic evolved from a war technicians training centre and this was established by the Govt. of India during World War II. In 1946, this training centre was named as Maharaja’s Technological Institute and diploma courses in Civil, Mechanical and Electrical Engineering were started in 1947-48. Later on in 1991-92 and 1998-99 Electronics Engineering and Computer Engineering diploma courses also began in this institution. When the Directorate of Technical Education was formed under Govt. 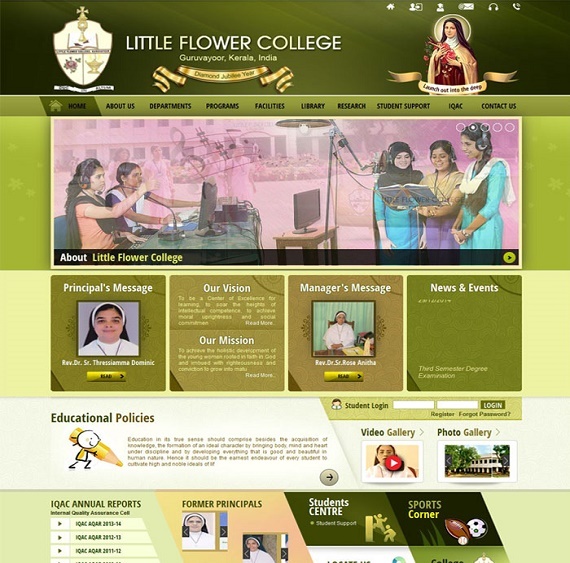 of Kerala, the Institution came under the administrative control of the Directorate. 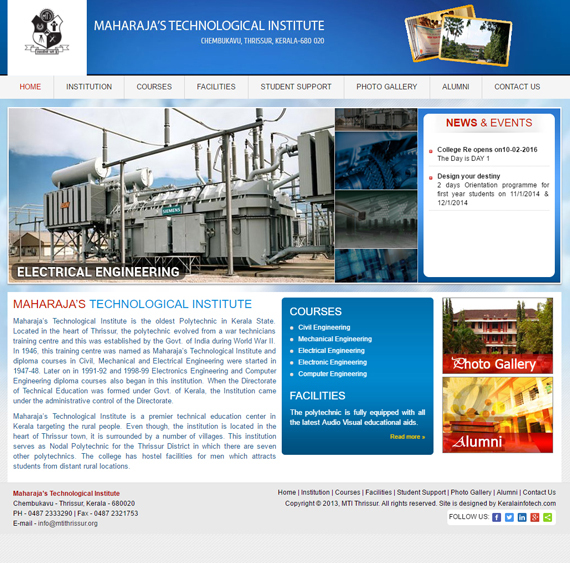 Maharaja’s Technological Institute is a premier technical education center in Kerala targeting the rural people. Even though, the institution is located in the heart of Thrissur town, it is surrounded by a number of villages. This institution serves as Nodal Polytechnic for the Thrissur District in which there are seven other polytechnics. The college has hostel facilities for men which attracts students from distant rural locations. 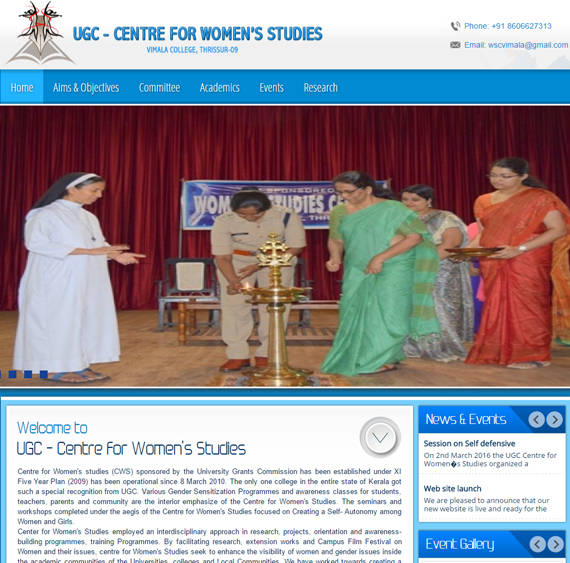 Centre for Women's studies (CWS) sponsored by the University Grants Commission has been established under XI Five Year Plan (2009) has been operational since 8 March 2010. The only one college in the entire state of Kerala got such a special recognition from UGC. Various Gender Sensitization Programmes and awareness classes for students, teachers, parents and community are the interior emphasize of the Centre for Women's Studies. The seminars and workshops completed under the aegis of the Centre for Women's Studies focused on Creating a Self- Autonomy among Women and Girls. Center for Women's Studies employed an interdisciplinary approach in research, projects, orientation and awareness-building programmes, training Programmes. By facilitating research, extension works and Campus Film Festival on Women and their issues, centre for Women's Studies seek to enhance the visibility of women and gender issues inside the academic communities of the Universities, colleges and Local Communities. We have worked towards creating a platform for sensitizing parents of the students; members of self help groups and Schools in the Local Community. 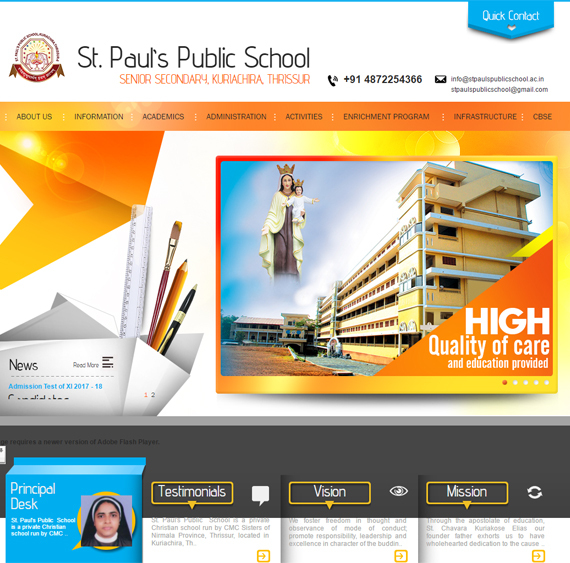 ST. PAUL’S PUBLIC SCHOOL, Managed by the Sisters of the Congregation of Mother of Carmel of Thrissur Nirmala Province, aims at providing quality education to our children. It was founded in 2005. The school has been imparting instruction to students from Standard I to XII of this academic year as per syllabus stipulated by Central Board of Secondary Education (C.B.S.E. ), New Delhi. 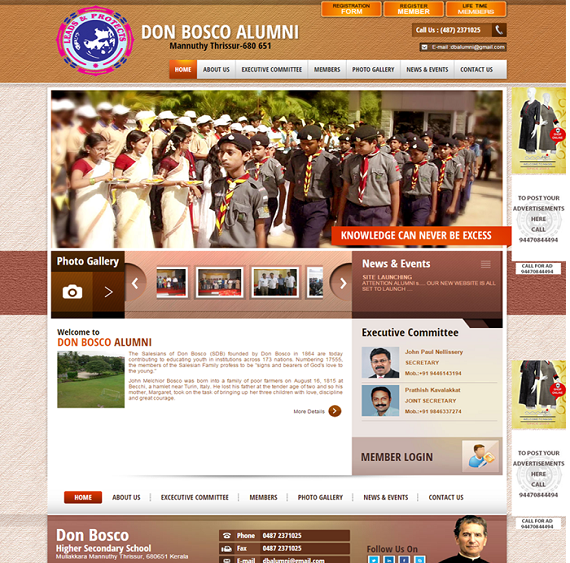 The Salesians of Don Bosco (SDB) founded by Don Bosco in 1864 are today contributing to educating youth in institutions across 173 nations. Numbering 17555, the members of the Salesian Family profess to be "signs and bearers of God's love to the young." John Melchior Bosco was born into a family of poor farmers on August 16, 1815 at Becchi, a hamlet near Turin, Italy. He lost his father at the tender age of two and so his mother, Margaret, took on the task of bringing up her three children with love, discipline and great courage. 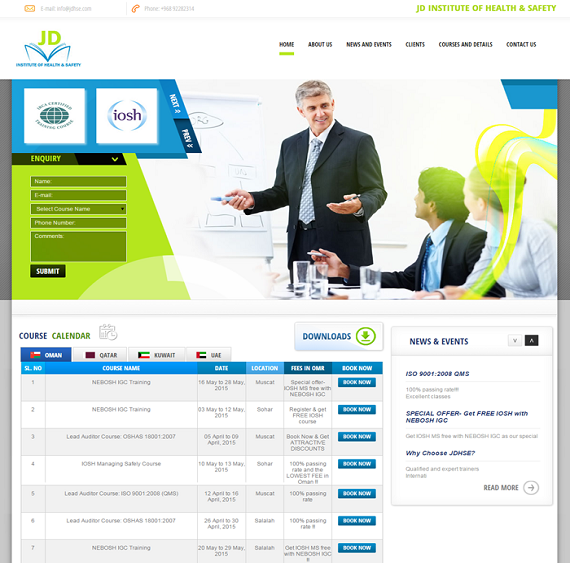 JDI was founded by a team of HSE professional on 2002 with international experience to offer world class qualification and services in Occupational Safety, Health and Environment. The training courses offered by JDI are approved by Oman Government and awarded by world renowned training and professional organizations. 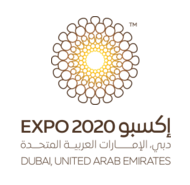 We are also committed in assisting government and private organizations working towards developing new standards for the improvement of occupational Health, Safety and Environment. 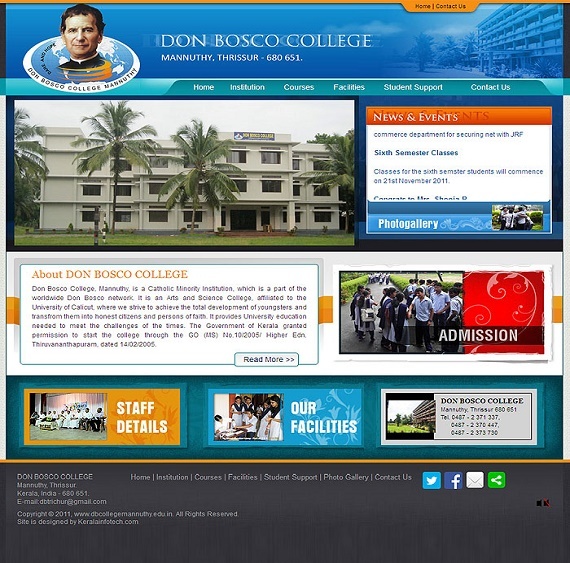 Don Bosco College, Mannuthy, is a Catholic Minority Institution, which is a part of the worldwide Don Bosco network. It is an Arts and Science College, affiliated to the University of Calicut, where we strive to achieve the total development of youngsters and transfrom them into honest citizens and persons of faith. It provides University education needed to meet the challenges of the times. 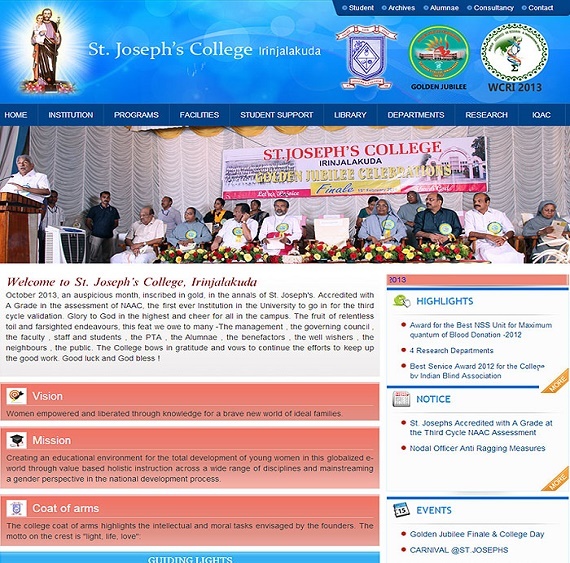 The Government of Kerala granted permission to start the college through the GO (MS) No.10/2005/ Higher Edn. Thiruvananthapuram, dated 14/02/2005. A Letter to the Parents..
"A letter to the parents of students , who passed SSLC or CBSE or any board exam in this year. A letter to the parents of students who passed SSLC or CBSE or any board exam in this year. A letter to the parents of students who passed SSLC or CBSE or any board exam in this year. A letter to the parents of students who passed SSLC or CBSE or any board exam in this year." Analysis of data is a process of inspecting, cleaning, transforming, and modeling data with the goal of discovering useful information, suggesting conclusions, and supporting decision making. Data analysis has multiple facets and approaches, encompassing diverse techniques under a variety of names, in different business, science, and social science domains. Data mining is a particular data analysis technique that focuses on modeling and knowledge discovery for predictive rather than purely descriptive purposes. Analysis of data is a process of inspecting, cleaning, transforming, and modeling data with the goal of discovering useful information, suggesting conclusions, and supporting decision making. 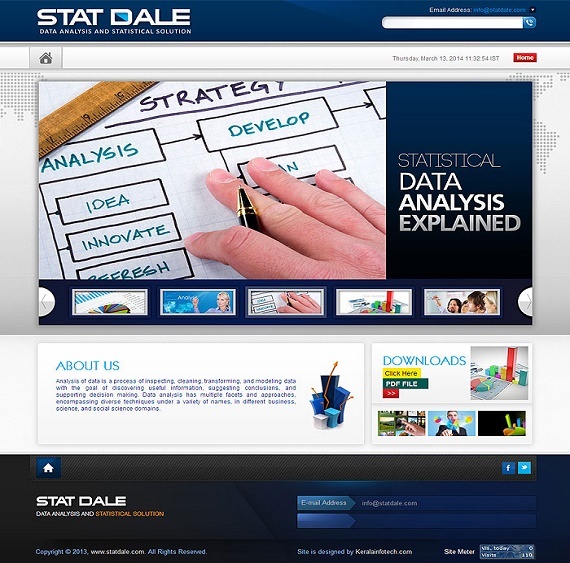 Data analysis has multiple facets and approaches, encompassing diverse techniques under a variety of names, in different business, science, and social science domains. The Institute of Chartered Accountants of India (ICAI) is a statutory body established under the Chartered Accountants Act, 1949 (Act No. XXXVIII of 1949) for the regulation of the profession of Chartered Accountants in India. 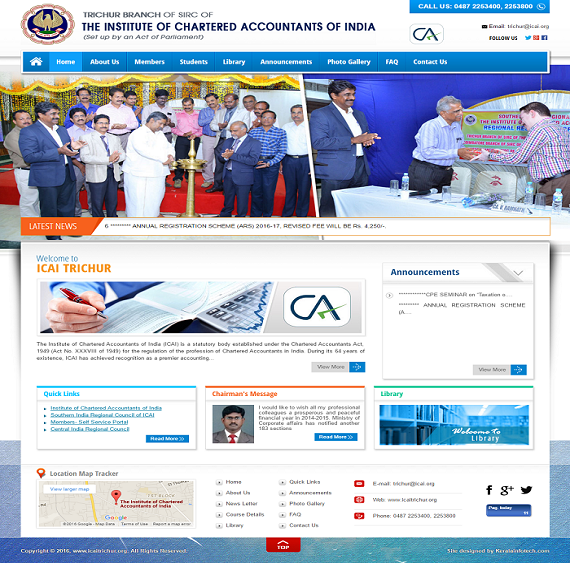 During its 64 years of existence, ICAI has achieved recognition as a premier accounting body not only in the country but also globally, for its contribution in the fields of education, professional development, maintenance of high accounting, auditing and ethical standards.ICAI now is the second largest accounting body in the whole world. Established in 1945 as Government Training College and inaugurated on 4th July by Sir George Boag, then Dewan of Cochin. It remained as an eminent teacher training institute to churn out teachers of excellence. It was at first affiliated to the University of Madras. The college was wound up as a measure of retrenchment with the integration of Travancore and Cochin in 1949. 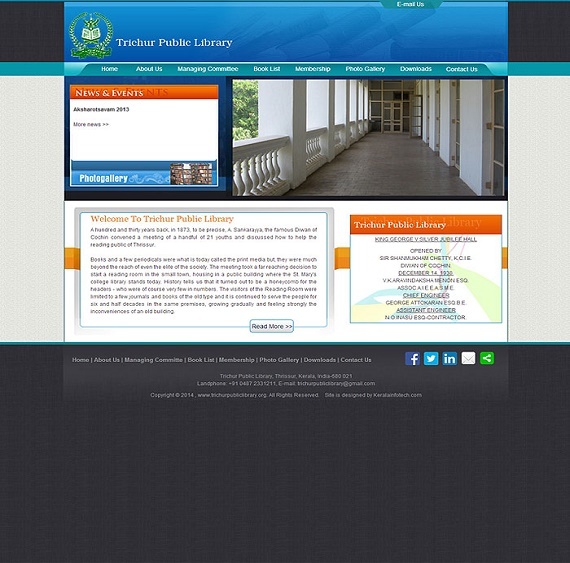 It was restarted in 1951 by affiliating it to Travancore University. The college has got affiliation to the University of Calicut in 1968. The College has been elevated to the status of Institute of Advanced Study in Education since 1993 with a view to conduct advanced courses in education, research programmes and to organize In-service training to the secondary and higher secondary school teachers. 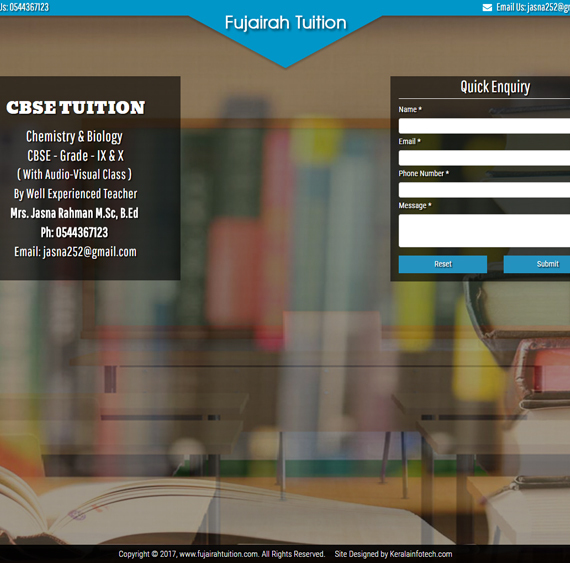 The course will cover 70 papers in Physics, 70 papers in Chemistry, 75 papers in Biology and 40 papers in Maths. The first year topics will be finished in the first year itself and the second year topics by December end. This is only an approximate indication of time schedule. Vacation and Sunday batch students will have more than 100 examinations during the two years. Regular batch students will have more than 200 examinations during the two years. Repeaters batch students will have more than 200 examinations during one year. 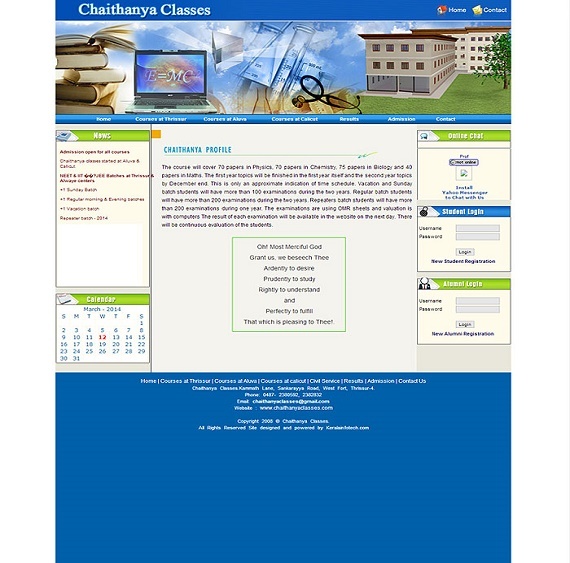 The examinations are using OMR sheets and valuation is with computers The result of each examination will be available in the website on the next day. There will be continuous evaluation of the students. Trainer is highly experienced with More than 10 International Certifications and More than 15 years experience. 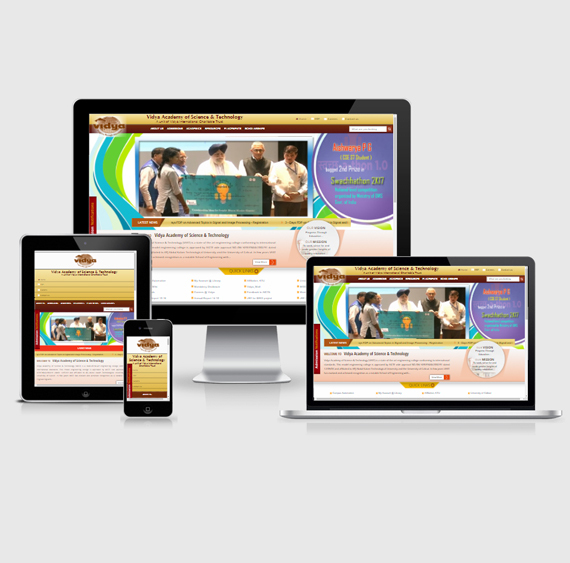 Also handles Online Training for US clients. A hundred and thirty years back, in 1873, to be precise, A. Sankarayya, the famous Diwan of Cochin convened a meeting of a handful of 21 youths and discussed how to help the reading public of Thrissur. Books and a few periodicals were what is today called the print media but, they were much beyond the reach of even the elite of the society. The meeting took a far reaching decision to start a reading room in the small town, housing in a public building where the St. Mary's college library stands today. History tells us that it turned out to be a honeycomb for the headers - who were of course very few in numbers. The visitors of the Reading Room were limited to a few journals and books of the old type and it is continued to serve the people for six and half decades in the same premises, growing gradually and feeling strongly the inconveniences of an old building. 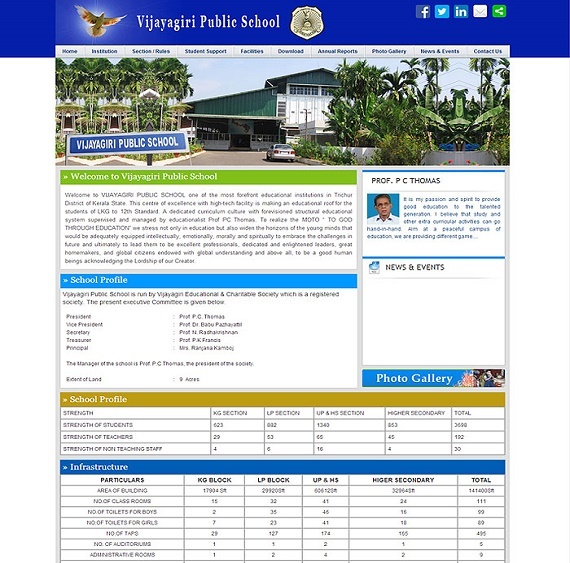 Welcome to VIJAYAGIRI PUBLIC SCHOOL one of the most forefront educational institutions in Thrissur District of Kerala State. This centre of excellence with high-tech facility is making an educational roof for the students of LKG to 12th Standard. 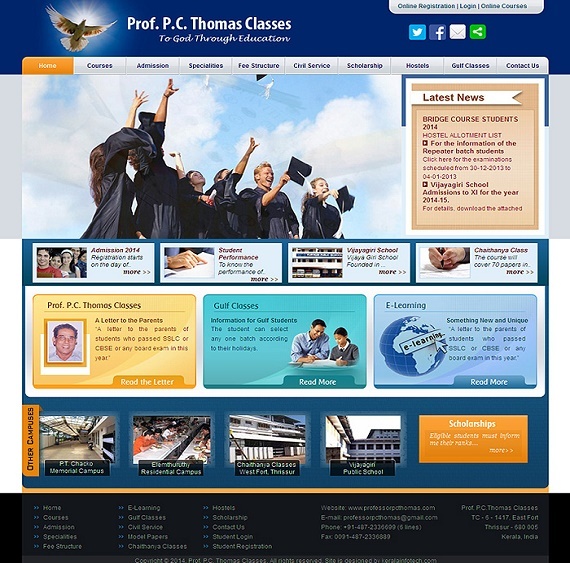 A dedicated curriculum culture with forevisioned structural educational system supervised and managed by educationalist Prof PC Thomas. To realize the MOTO “ TO GOD THROUGH EDUCATION” we stress not only in education but also widen the horizons of the young minds that would be adequately equipped intellectually, emotionally, morally and spiritually to embrace the challenges in future and ultimately to lead them to be excellent professionals, dedicated and enlightened leaders, great homemakers, and global citizens endowed with global understanding and above all, to be a good human beings acknowledging the Lordship of our Creator. 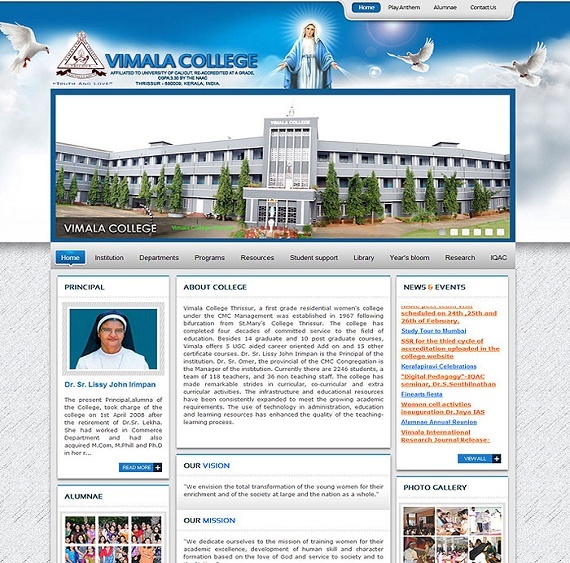 Vimala College (Autonomous), a first grade women's college under the CMC Management, was established in 1967 in Thrissur District, Kerala.Ever since its inception, the college has been in the fore-front of higher education in the state.The college offers 16 Undergraduate and 13 Postgraduate programmes, and is a Centre for Research in English,Commerce and Physics.This multi-faculty Institution has an enrolment of 2537 students, 121 faculty members and 36 non teaching staff.The institution was accorded autonomy in 2015 and conferred the status of College with Potential for Excellence in 2016.The three NAAC Accreditations bestowed on the Institution Five Star Status (2001), A Grade with a CGPA of 3.5 (2014).All efforts are made to sustain and enhance quality through the synchronization of innovative measures and traditional values.The college has made remarkable strides in curricular, co-curricular and extra curricular activities. 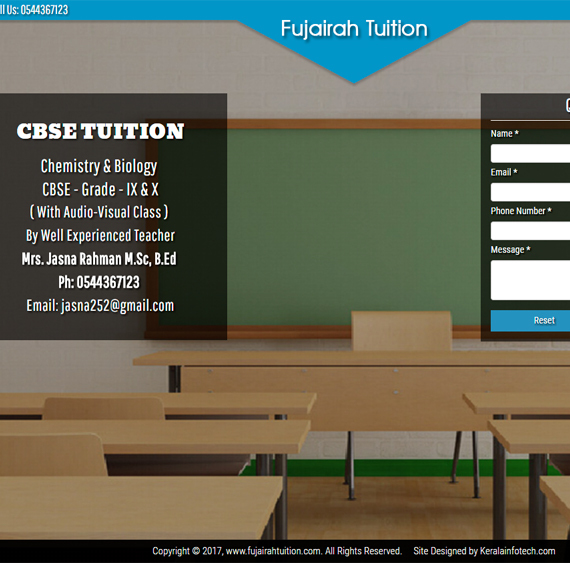 The infrastructure and educational resources have been consistently expanded to meet the growing academic requirements. The use of technology in administration, education and learning resources has enhanced the quality of the teaching-learning process. 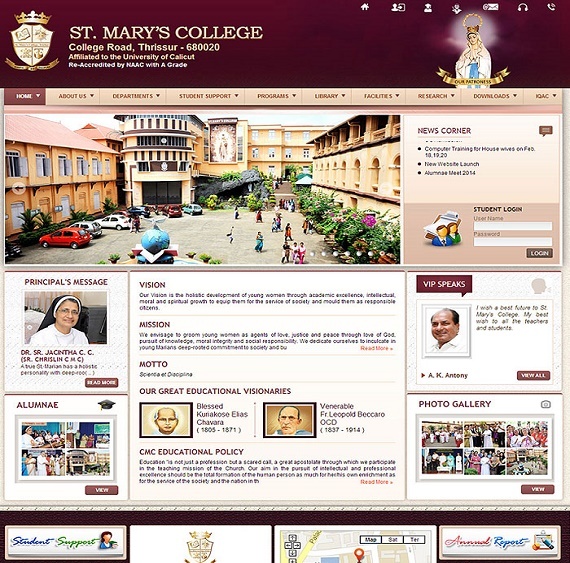 St.Mary’s College, the pioneer First Grade College for women in the District, affiliated of the University of Calicut is situated in the heart of Thrissur, the cultural capital of Kerala. It was established in 1946 and is administered by the CMC Educational Society under the Nirmala Province of the Congregation of the Mother of Carmel (CMC) in the Roman Catholic Church. The College is re-accredited with ‘A’ Grade by National Assessment Coucil (NAAC) in 2010. The Sisters of the Congregation of the Mother of Carmel entered the field of Higher Education in 1946 with the inception of St. Mary’s College, Thrissur. It soon grew into a full-fledged First Grade College with two Post Graduate courses in Economics and English Literature. In 1964, Mercy College was started in Palakkad which now caters to thousands of students in a town backward in literacy. In 1967 St. Mary’s was bifurcated, the Pre-Degree section remaining in Thrissur and the Under-Graduate and Post-Graduate sections being shifted to Vimala College, Cheroor. In 1975, the Colleges under the Management were registered as a society, viz, “CMC Educational Society” under the Travancore-Cochin Literary, Scientific and Charitable Societies’ Registration Act XII. In 1981, Carmel College has been started in Mala under the same Management. All the four colleges are functioning quite successfully and smoothly maintaining a high standard in academic and non-academic matters. 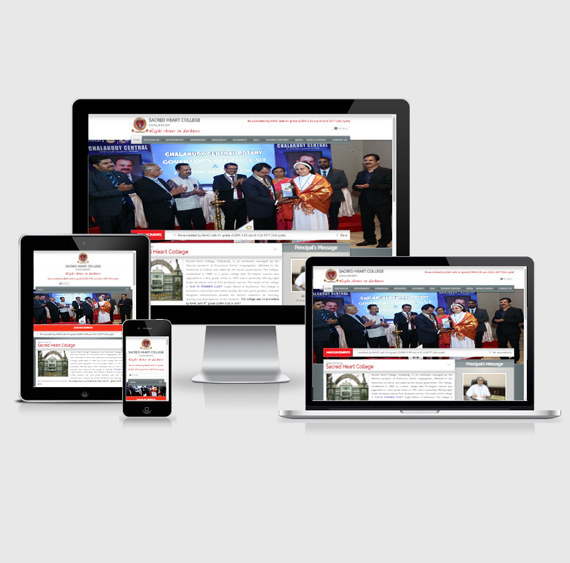 After the trifurcation of the Management in 1987, St. Mary’s and Vimala Colleges are still under the CMC Educational Society, Thrissur which has a creditable history in the field of Education. St. Mary’s once again regained its status as a First Grade College in 1979 with the starting of BA and BSc courses. Post-graduate courses in Mathematics and History were introduced in 1995 and 1998 respectively. In 1998, delinking of the Pre-Degree courses was started and was completed in 2001. Meanwhile, degree courses in Polymer Chemistry (1999), Biotechnology (2000), Microbiology (2001) and BCA (2001) wereintroduced. 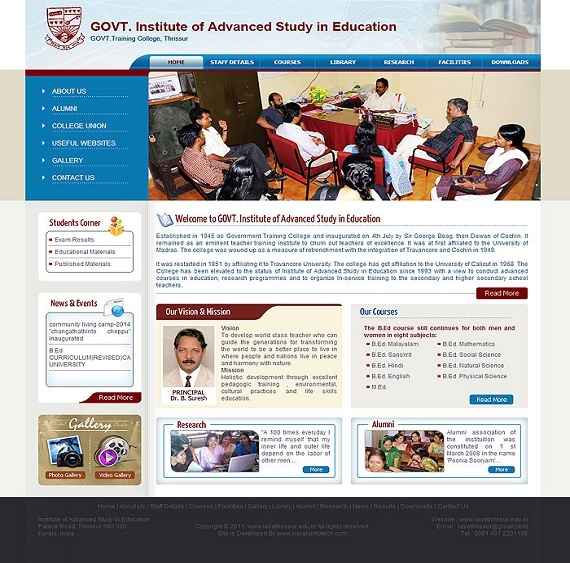 PG courses in Microbiology, Biotechnology and Computer Science were started in 2002, 2003 and 2004 respectively. National Assessment and Accreditation Council (NAAC), an autonomous body of the University Grants Commission (UGC) has accredited the College, at the B+ level in 2004 and re-accredited with ‘A’ Grade in 2010. The College celebrated her Diamond Jubilee in 2006. The word “Hatha Vidya” means the wisdom of yoga. The term ‘Hatha’ in Sanskrit is composed of two syllables ‘Ha’ and ‘tha’, ‘ha’ represents the prana or vital energy and ‘tha’ means the moon, representing the mental energy. By practicing Hatha Vidya, these two energy flows are synchronized leading to a balanced state of mind. Hatha Vidya is the purest and the most traditional form of yoga. It is the first step to improve one’s psycho physiological state (mind and body) and complete well being. Hatha Vidya empowers one to control the mind through body. Started in 1998, the school is run by M. K. Letha Memorial Educational and Cultural Trust Education is provided in English medium and follows the ICSE syllabus. The Mission of the School is to impart all round quality education to the children of the surrounding region and develop them as future citizens. To achieve this, the School places special emphasis on the overall development of the student, giving equal importance to academics, extra-curricular activities, cultural and personality development. Sports also forms a major part of the students’ activities. Teaching method followed places great importance on understanding and imbibing knowledge of whatever is taught rather than memorizing lessons.